Dr. Rivera's dream of becoming a veterinarian brought her from Puerto Rico to Michigan where she received her doctorate from Michigan State University in 2016. In order to enhance her knowledge and provide the best care to her patients she also completed a Small Animal Medicine and Surgery Rotating internship at the University of Tennessee Small Animal and Exotic Medical Center in 2017. 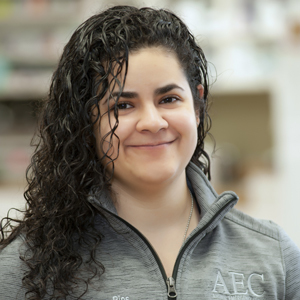 Dr. Rivera joined AEC following her internship, and is a member of the MVMA, AVMA, IVECCS and SEMVMA. Dr. Rivera has a special interest in diagnostic imaging and behavior medicine, and was the recipient of the Boerhinger-Ingelheim Clinical Behavior Award in 2016. Dr. Rivera is passionate about providing her patients with comfortable and stress free handling. Dr. Rivera lost her own faithful companion, a golden retriever named "Gob", due to a bleeding heart mass early in her career. That personal experience helped reinforce the importance of the role of an emergency veterinarian and the impact they make to families. "I bring compassionate care and excellent treatment to each individual patient and client. I love the challenges that emergency medicine provides, and will not rest until I have done everything to give my patients the best possible outcome." Dr. Rivera has two dogs (10 month old mix-terrier and a 6 month old Golden Retriever puppy), one Puertorrican cat, one Michigander cat, two rescue parakeets, one rescue rabbit and three fresh water fish tanks. In her time off she enjoys spending time with her pets, aquascaping her fish tanks, and spending time with her Michigan family. Dr. Rivera is also the guardian for a very special redhead boy with Duchenne muscular dystrophy.